← New Forest: £1000 reward to find hit-&-run drivers. Only approved, licensed stallions are permitted to roam free on the New Forest. Anticipation is mounting across the Forest, as the annual Stallion Inspection approaches. Owners will currently be working with their ponies to ensure that they are prepared for the show ring and can walk and trot whilst being led and are able to stand squarely for the confirmation inspection. The pony’s behaviour, as well as his looks, is considered in the final stallion licensing decision. 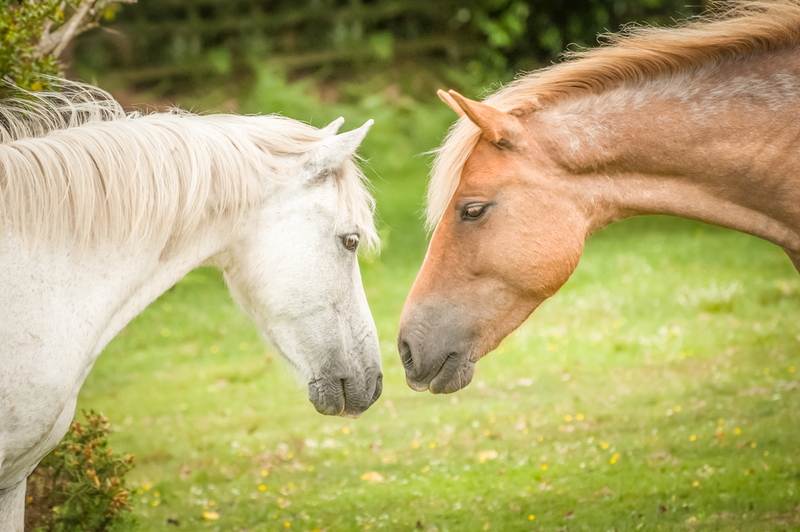 It’s a tense time for those putting their animals forward but a worthwhile process that has been safeguarding the quality of the New Forest pony breed for generations. History has shown, however, that horse breeding has not always been so carefully managed. In the Middle Ages, for example, the breeding of horses was a fairly haphazard affair and mares and stallions would have generally roamed free on common land where nature could take its course. Horses in those days were not identified by their breed or pedigree but by their use or appearance. A destrier, for example, was a warhorse that would have been highly prized by knights and mounted men-at-arms; often referred to as a ‘Great Horse’, destriers were in fact no more than 15-16 hands* high. A knight would have also ridden a courser, a cheaper version of the destrier, for hunting and warfare and ridden a rouncey for general-purpose use. A palfrey, described as a docile type of riding horse, was suitable for a woman; whereas a sumpter was a type of packhorse used to carry baggage. There were also ambling horses, pads, cobs, hobbies, garrons and other names for the functions these horses served. Whilst horse breeding in the main was a casual matter, stud farms did exist. Henry III, in 1217, ordered the profits from the royal stud in the New Forest be used to build Beaulieu Abbey. It was not unusual for monasteries to be involved in horse breeding and they would have been well ordered places where the mares would have been better protected from the advances of random stallions. In 1300 it was recorded that the abbot of Beaulieu kept 80 colts, horses and foals outside his enclosed land, and that the abbot of Natale had 10 horses and mares in the forest. These studs were more about producing large numbers of horses, rather than distinct breeds. Indeed, the church would certainly not have approved of the incestuous techniques of in breeding, which preserved particular qualities and confirmation points, which were adopted in a later more secular age. Of course, Henry VIII dissolved the monasteries during his reign in the 16th century, and the good work undertaken by the monks in producing horses came to an end. Nevertheless, in 1535 King Henry was disappointed to find that “in most places of this Realme little horsis and naggis of small stature and valeu be suffered to depasture and also to covour marys and felys of very small stature.” He passed legislation to cull under height horses and decreed that no stallion under 15 hands high and no mare under 13 hands was allowed to run free on common land. Under Henry VIII’s command an annual round up was ordered, to take place 15 days after Michaelmas, which would sort out the worthy animals from the rejects. His edict was mostly ignored and the little horse of the New Forest survived. The drifts also survived and are the basis for the modern-day round-ups that occur on the New Forest each autumn. However, its present purpose is primarily to check the ponies for health and welfare before turning them loose to return to the Forest. 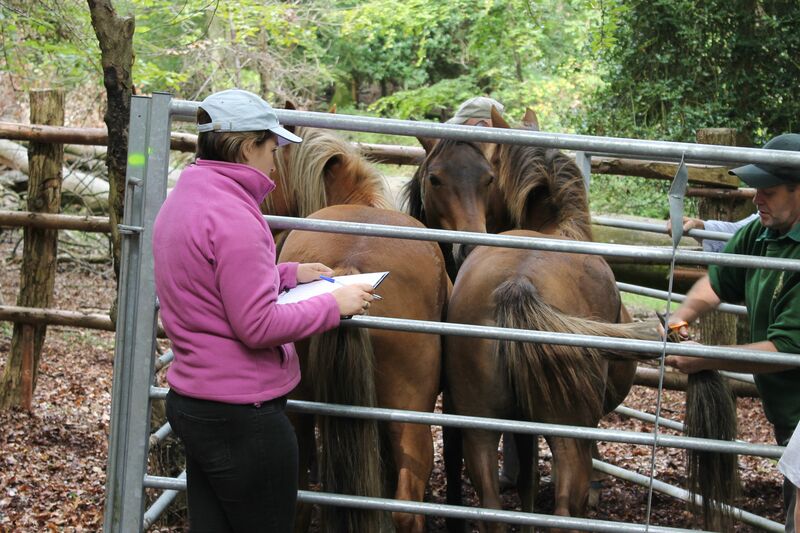 During the annual drifts ponies are checked for health, marked and then released back onto the Forest. *A hand is the measurement of a man’s hand, taken from the knuckle closest to the palm of his index finger through to the knuckle of his little finger. It was the quickest way to establish the height of a horse. Men would have placed one hand on top of the other, knuckle to knuckle, from the ground at the horses front foot all the way up to its withers counting as they went. This entry was posted in New Forest, New Forest pony and tagged Beaulieu Abbey, Beaulieu Road, breeding, colts, confirmation, courser, cull, destrier, drift, foals, garron, hand high, Henry III, Henry VIII, hobbies, mares, Middle Ages, monastery, monks, New forest, pack horse, palfrey, ponies, pony, rouncey, round-up, stallion inspection, stallions, stud farm, sumpter, trot, walk, war horse, warhorse. Bookmark the permalink.